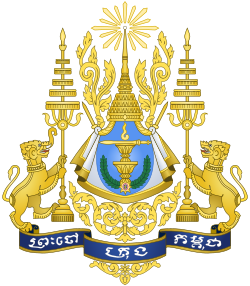 The royal coat of arms of the Kingdom of Cambodia is the symbol of the Cambodian monarchy. They have existed in some form close to the one depicted since the establishment of the independent Kingdom of Cambodia in 1953. It is the symbol on the Royal Standard of the reigning monarch of Cambodia. Depicted on the coat of arms are two animals which are a gajasingha (a lion with an elephant trunk) on the left, and a rajasingha (a royal lion), on the right. Supported by the animals are two royal five-tiered umbrellas representing the King and the Queen[ត្រូវការអំណះអំណាង]. In between is a royal crown with a shining diamond at its top. On a light blue field beneath the Crown are an Unalome sign (Khmer-Thai version of the Aum symbol) atop a sacred sword, which rests on two stacked phan (pedestalled platters). The Khmer language phrase on the banner beneath the royal arms translates to: ព្រះចៅ (royal or auspicious ruler) - ក្រុង (area, or in this case, kingdom) - កម្ពុជា (Cambodia): "Ruler of the Kingdom of Cambodia". The royal arms were discontinued with the overthow of the monarchy in the Republican Era (1970–1975). They were restored for official use in 1993 with the reinstatement of the monarchy under HM Norodom Sihanouk. Other arms were used during succeeding periods: Democratic Kampuchea (i.e., Khmer Rouge era: 1975-1979), the People's Republic of Kampuchea (1979–1989), and the State of Cambodia (1989–1993).